Home DUB Speak Freshers, it’s time to pop the bubble! Freshers, it’s time to pop the bubble! Congratulations to you, freshers! You’re now officially a student of Delhi University in spite of its skyscraper like cut-offs. And by now I am guessing you must have had a taste of the LONG metro rides, the dreaded Rajiv Chowk crowd, lectures at 8:45AM or the trouble to manage the limited pocket money because let’s be honest, there are way too many places to eat and shop and very little money. But there are many more important and grave changes that you’ll experience in your first year at college which your school didn’t really prepare you for. 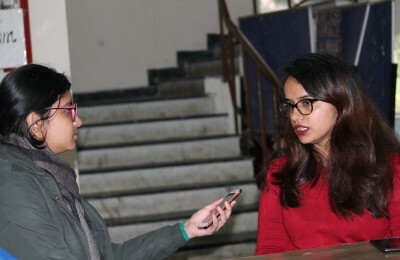 Everyone is aware of the fact that because of Delhi University’s reputation as one of the premier educational institutes, it caters to a large variety of students from all over the country. This sort of diversity may or may not have been present in schools. And, because of the usual habit to stay in our comfort-zones, we often don’t expand our social circle to include these out-station kids. But, trust me, take a chance. Talk to them and make them feel comfortable. They are not only dealing with the anxiety of stepping into a new college but also the anxiety of living in a completely new place often without the warmth of family and homely-cooked food. Thus, don’t just reduce them to stereotypes but rather rise above them. Try to know more about them and their culture. You can make them experience the ever so famous “Dilli-life” which can range from trying golgappe and chaats to exploring and visiting different places and monuments. You’ve given your boards and got a percentage which is soaked in your sweat, blood and the numerous cups of coffee that helped you burn the midnight oil. But, it is time to make peace with the fact that you’ll hardly ever see your college mark sheet with a percentage above ninety percent. In the next three years you’ll see people participating in innumerable events, building a CV or more importantly, building a personality. And a personality is something which will set you apart from the crowd. Thus, PARTICIPATE. Audition for the various different societies at your college, participate in college or departmental elections or join a not-for-profit student run organisation. Make use of the fact that college is a place where no one knows your history and you literally have a clean slate which makes it the ideal time to explore aspects and fields you never knew you’ll develop an interest in. With time you’ll realise that the classmate you started hanging out with has a starkly different set of opinions and moral code than yours. Or you might start comparing this newly formed bond with the bond you share with your school friends, who are now spread all over the country in different colleges, which gives rise to expectations which may or may not be met. It is okay. Everyone is different and handles situations differently. Accept this subjectivity. We might have gotten used to our circle which makes it sometimes difficult to understand the other person’s perspective but learn to agree to disagree and still maintain the friendship. It is a part of growing up to be more open-minded and non-judgemental. And adopting a broader perspective to look at and handle things is something that college teaches you most definitely. All in all, you have the agency to carve this phase in any way you like. So, get out of that comfort zone, take chances, make proper use of your freedom and welcome the change with open arms! Department of Economics of Daulat Ram College is Here With DRCMUN’19! Daulat Ram College Presents Model United Nations!